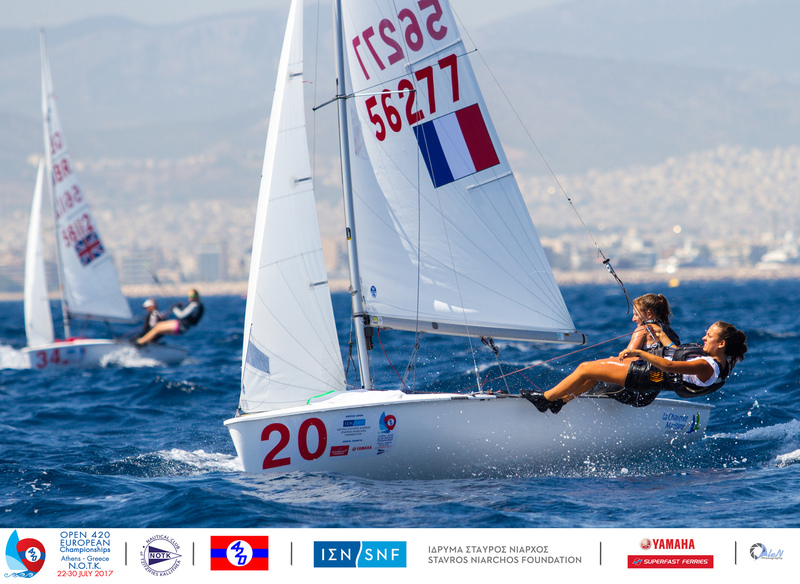 Onto day 2 at the 2017 420 Open European Championships, and two more races for each of the Open, Ladies and U17 fleets. The breeze started out at around 11 knots, building to 15-16 knots, before decreasing to around 12-13 knots for the final stages of the day’s second races. Reading the pressure and spotting the windshifts was critical and a huge test for the young teams on the challenging race track of the Saronic Gulf. The discard kicked in after race 3 and the inevitable leaderboard shuffles see new faces advance to the leaderboard top 5. Racing continues on Thursday 27 July with two races for all fleets, and the conclusion of the qualification series for the 420 Open division. 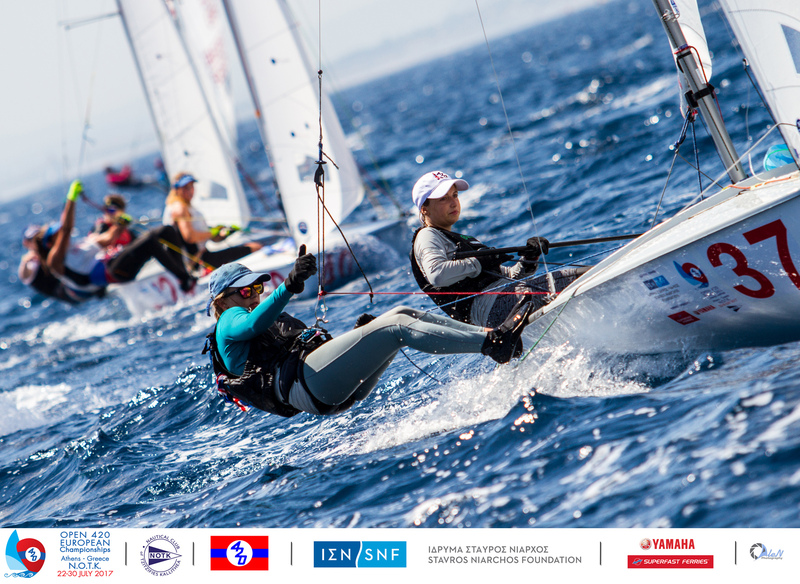 Overnight leaders Emma Kaneti/Ciara Rodriguez-Hora again managed the competition skilfully, racking up a 3,1 to hold a 5 points lead over the chasing Violette Orange/Camille Orion who leap up to second overall, having discarded their BFD penalty from race 2. Spain’s Marta Garrido/Clara Llabres knocked out finishes of 5,5, and gear up to third. 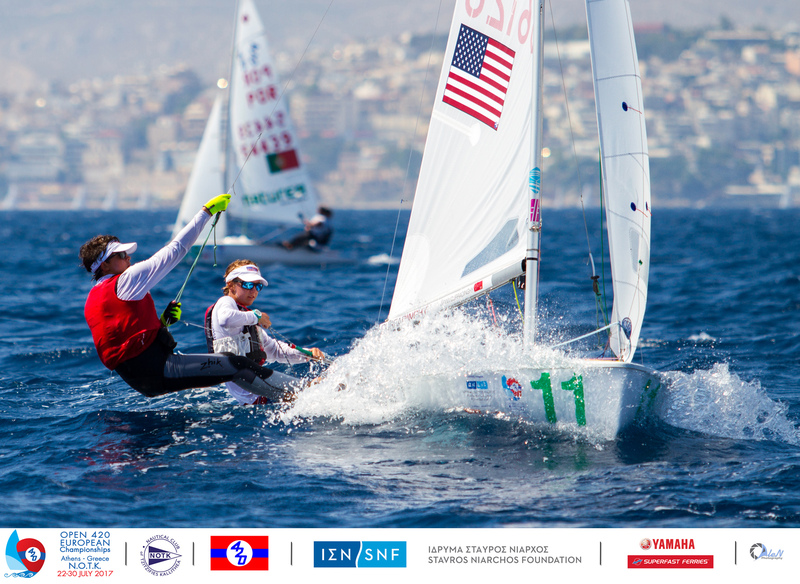 Early days, but aside from the series leaders all other teams are discarding a double-digit race results, whereas the America pair of Kaneti/Rodriguez-Hora count clean race results of 4,2,3,1, with their 4th place discarded. They have one in the bag over the rest – and can choose when they one to use it to take a race risk. Great Britain’s Hatty Morsley/Pippa Cropley claimed the opening race of the day, leading from start to finish. Their win stands out on a scorecard of double-digit results. 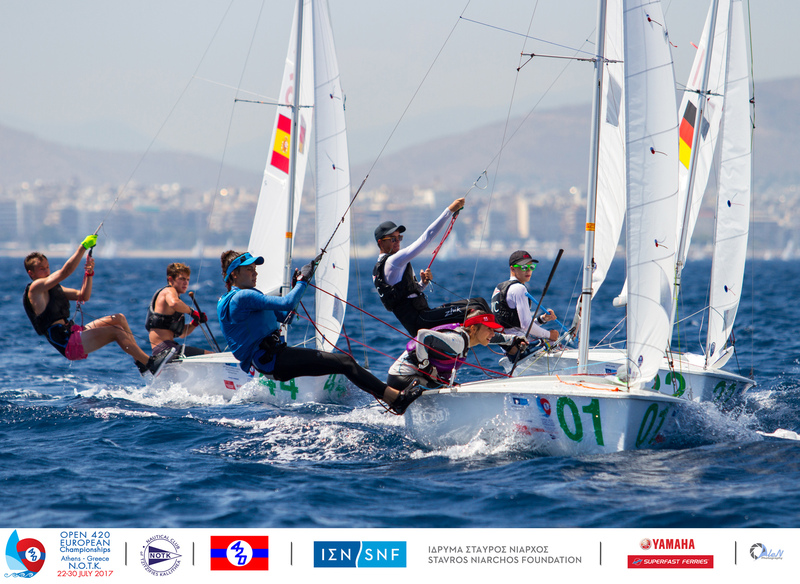 Finishing just behind in second place were Spain’s Patricia Reino/Carlota Hopkins who converted back of fleet finishes yesterday, of 40, 39 to two 2nd places today in a remarkable escalation on performance, and with it claimed the day’s biggest leaderboard gain. The pair leap up to 15th overall, from 44th. 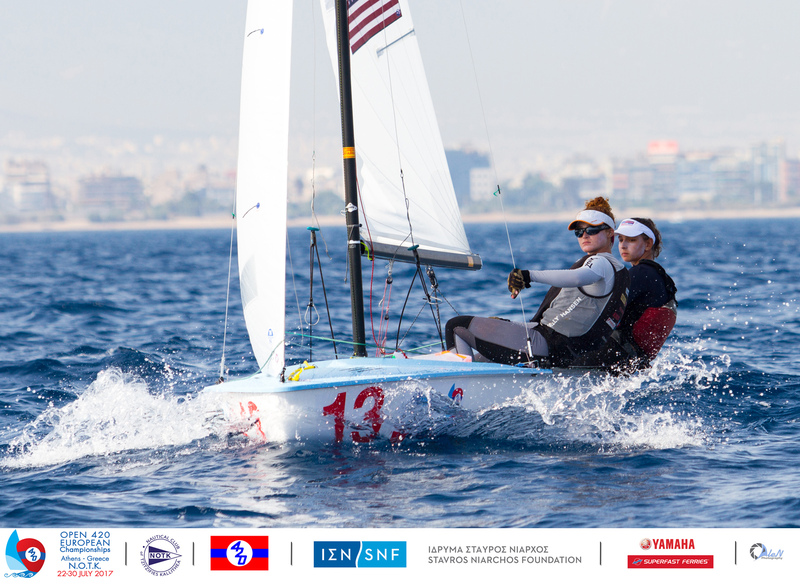 The USA’s Emma Cowles had the honour of reading the Athletes’ Oath at the Opening Ceremony, and has also been selected to represent the USA at the upcoming Youth Sailing World Championships in Sanya, China. 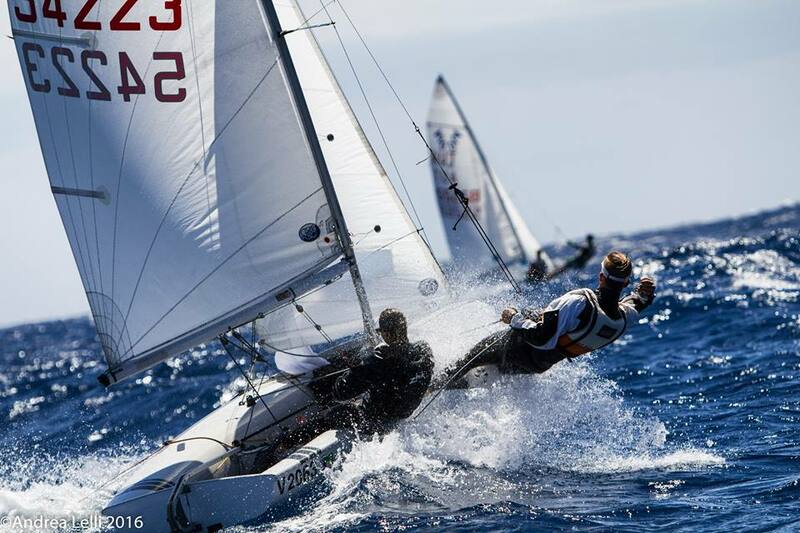 Today, she and helm Carmen, went into race day 2 in second overall after a tense first day. That is the story of the venue here, as the weather serves up a mix of conditions, demanding constant attention. On their plans going forwards, Cowles continued, “We are taking it race by race. Going upwind we are touching the side of the race course and are just focusing on the basics. 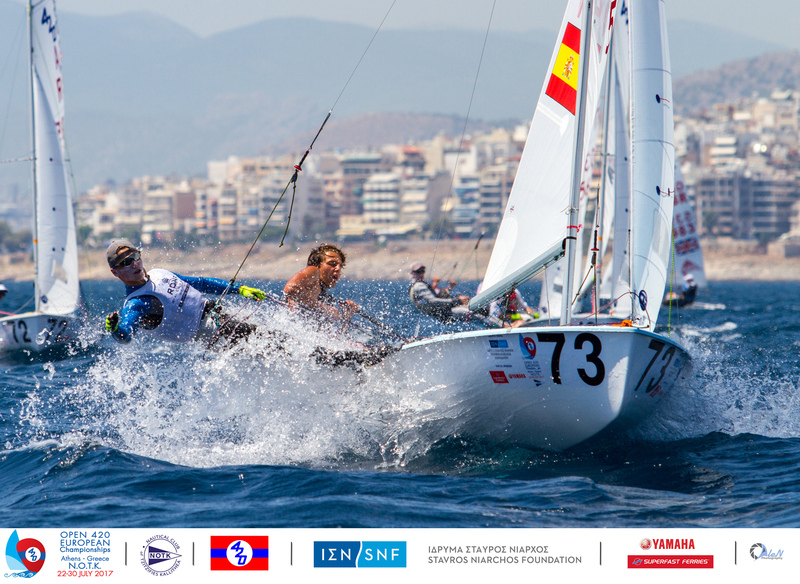 New faces in leaderboard first and second, as Spain’s Carlos Balaguer/Antoni Massanet leap up from 7th going into the day to lead by the end, after winning race 3 in the blue fleet, and following up with a 4th. The 77 boat Open division is split into yellow and blue fleets for the six-race opening series, with a further six-race final series in gold and silver fleets. 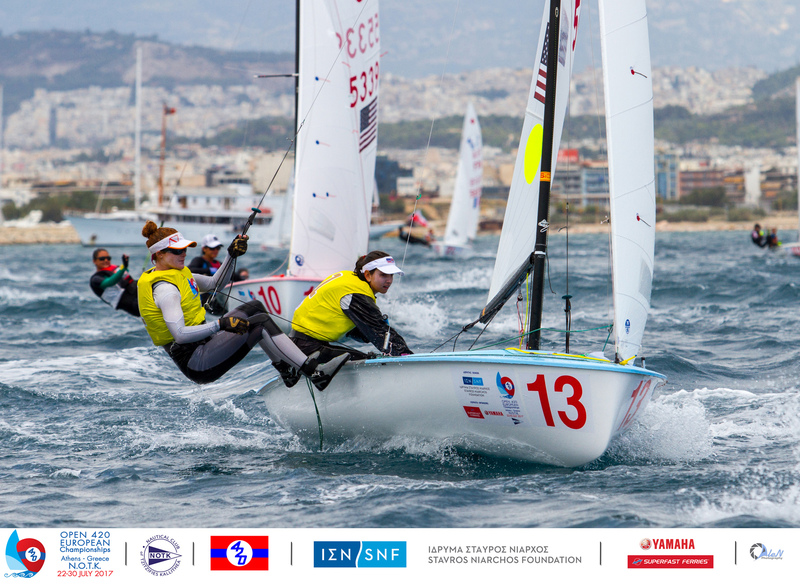 In the yellow fleet, Petros Mamounis/Nikos Giotopoulos (GRE) took the race 3 win, with France’s Jerome Demange/Luc Guimbertaud taking out the race 4 victory. The ever consistent Italian duo of Edoardo Ferraro/Francesco Orlando took out two second places and shift up to 2nd overall, just 1 point behind the leaders. 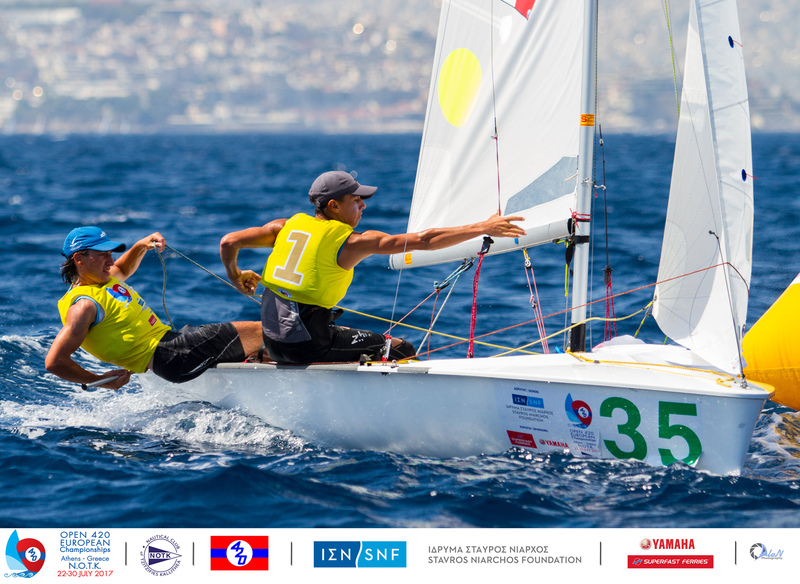 Reigning U17 World Champions and local stars, Greece’s Telis Athanasopoulos Yogo/Dimitris Tassios end the day where they started it, in third overall. The Greek partnership is most probably the most familiar with the water here, as Yogo explained, “We just practice, we go out at least four times a week,” with Tassios chipping in, “NOTK is our home club and we know the waters well. But, we are always trying to learn more." 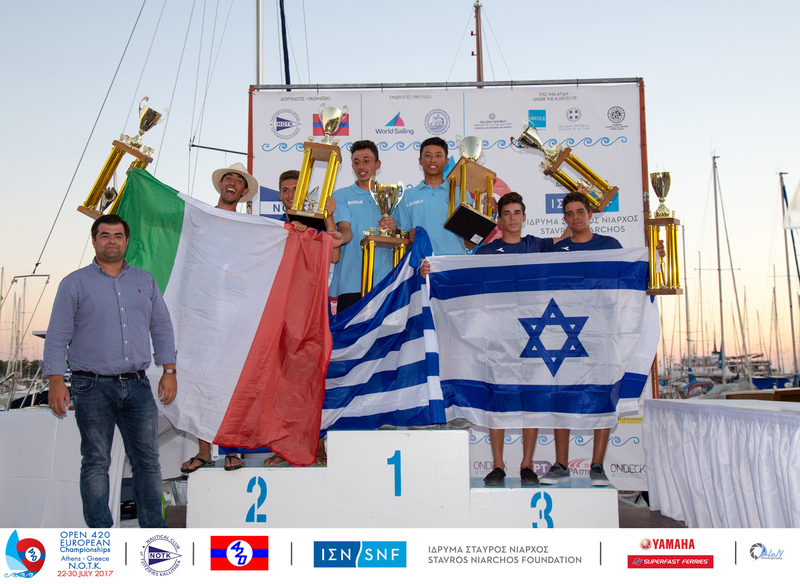 Italy’s Demi Rio/Matteo Barison won race 4 in the blue fleet, leading from the starting line, as they contest their first 420 Championship as a mixed team. The pair rank 15th overall. Each sailor has campaigned a 240 over multiple 420 Championships, and Barison has also made early steps into racing a 470 over the past year. Their performance has been a bit of a rollercoaster, as Rio laughed, “We hope to just do our best and get two good races in one day,” in reference to their 22,2,19,1 scores! 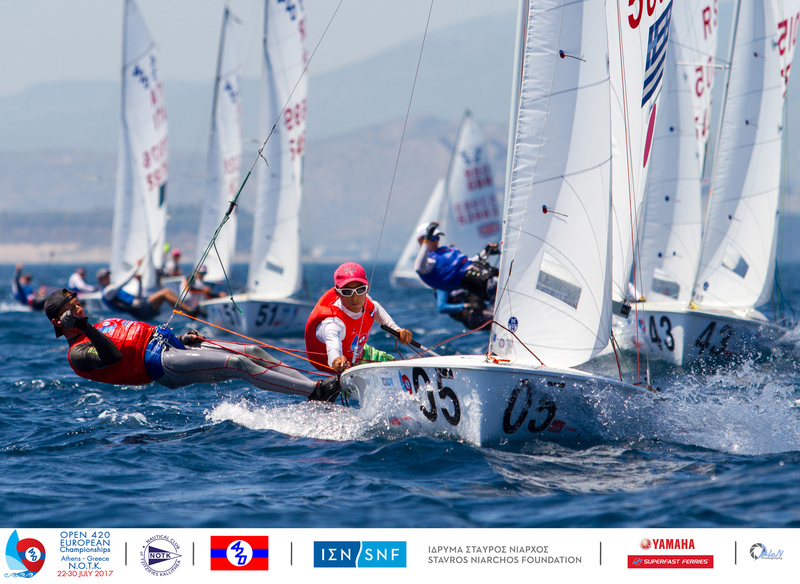 Two more races on Thursday 27 July will wrap up the qualification series and decide the top 39 boats advancing to the final series in the gold fleet. 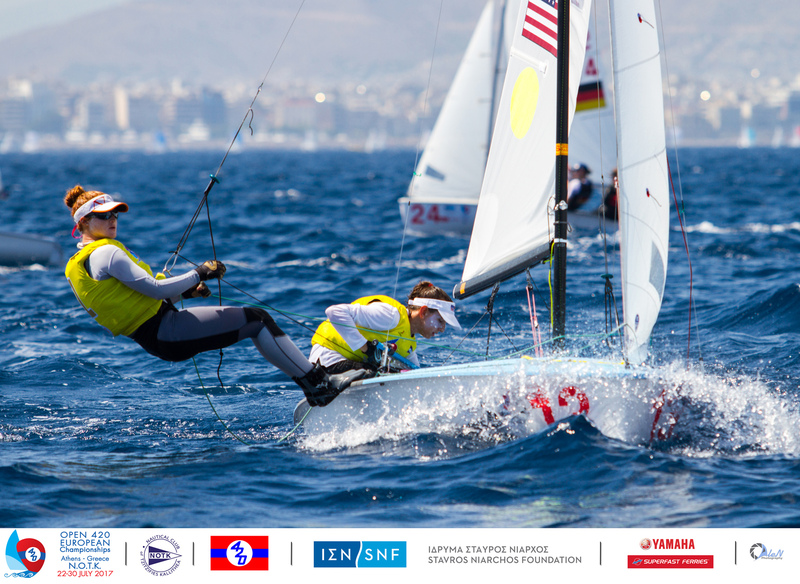 A stunning win to Greece’s Melina Pappa/Maria Tsamopoulou has helped rectify their 27 and DNE scores from yesterday, and the pair followed up with an 8th, but they still have a way to climb up from 22nd overall. 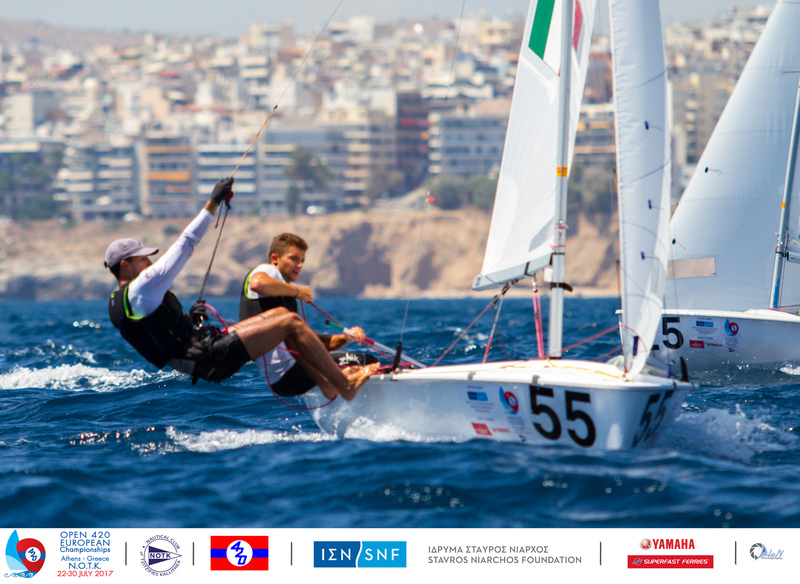 No change at the front as Italy’s Demetrio Sposato/Gabriele Centrone race a safe 4,9, with two new faces upgrading their scoreboards behind. Spain’s Martin Wizner/Pedro Ameneiro score a 2,2, and move up to second, whilst Germany’s Bjarne Studt/Piet Strohm score a matched 5,5 to move into third. 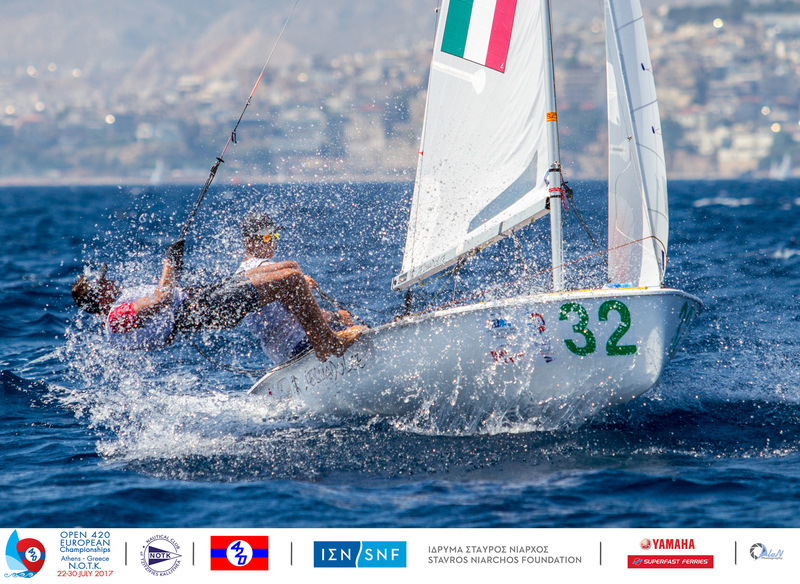 Italy’s Tommaso Cilli/Bruno Mantero seized the second win of the day, and discarding their DSQ from race 1, are back up in contention in fifth overall. 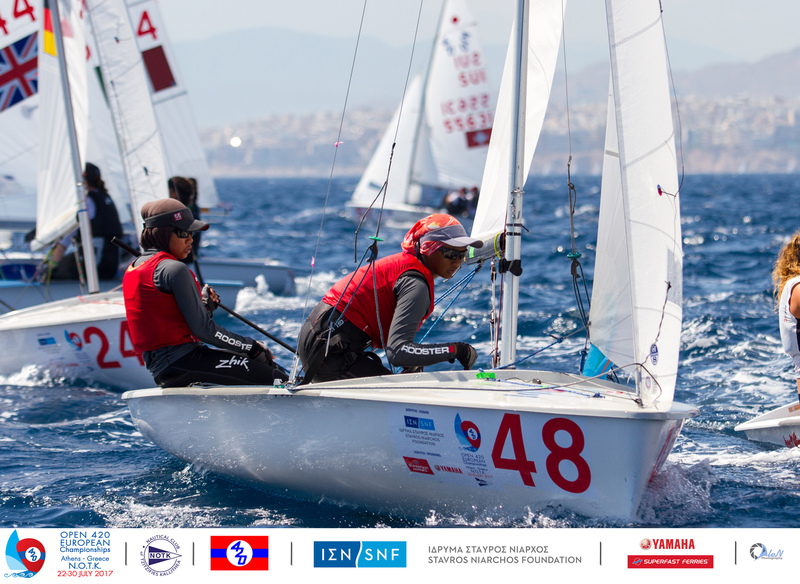 The U17 category was introduced in 2015 to support the transition of younger sailors to the 420 Class, providing an opportunity to race against a similar age group. 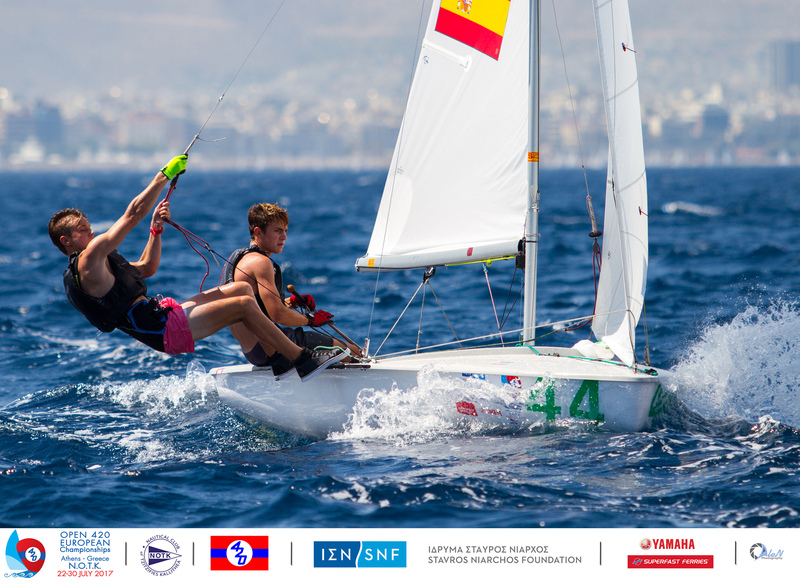 Competing at their first 420 Championship are many sailors fresh from the Optimist Class, including Great Britain’s Rhys Lewis/Drew Wright, who lie in 4th overall. 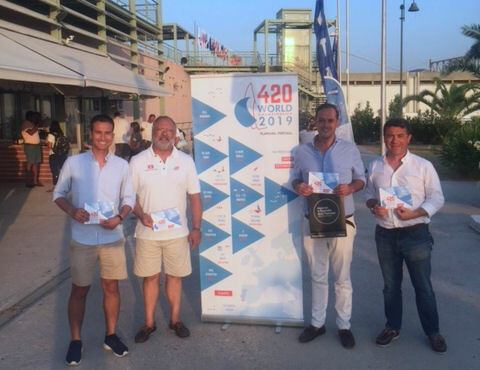 Last year, Lewis finished 114th at the Optimist Worlds, and just a few weeks ago finished 18th at the French 420 Nationals, competing against vastly more experienced and older teams. For now he is focused on maintaining leaderboard form, saying, "We were really pleased with our day yesterday, as conditions were tough and we were consistent. It is going to be tough all week and we just hope to stay up there." 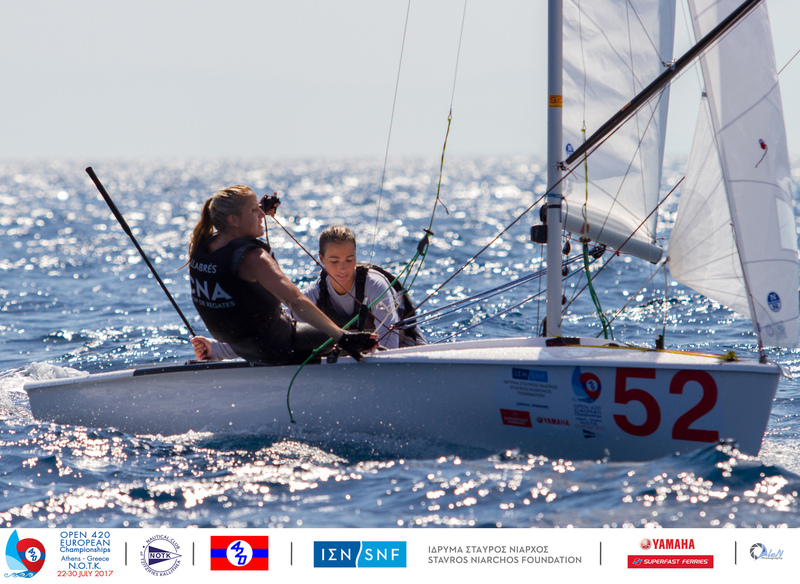 Italy’s Carlotta Scodnik/Camilla Scodnik have staked their claim as the top girls team in the U17 division, as they found their rhythm today to seize two top six finishes. 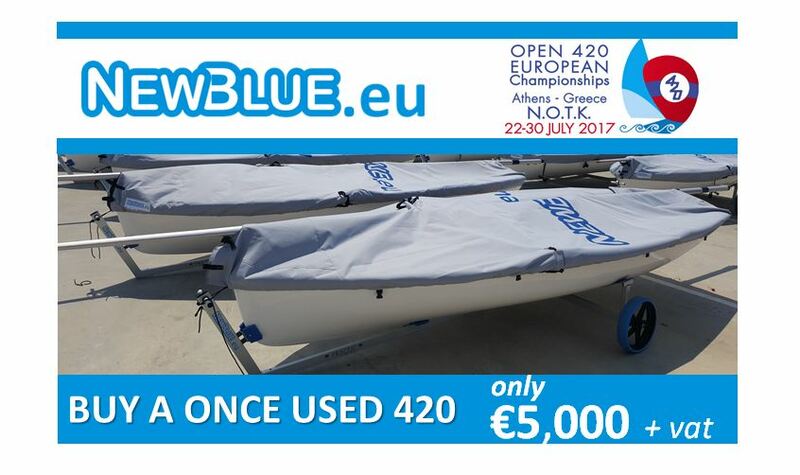 The 2017 420 Open European Championships is the first of four 420 Championships taking place in 2017, and will be followed by the 2017 420 Junior European Championships at Fraglia Vela Riva, Italy from 6-13 August 2017, the 2017 420 Team Racing World Championships also on Lake Garda from 23-26 August, and the year wraps up in Australia for the 2017 420 World Championships hosted at Fremantle Sailing Club from 26 December 2017-3 January 2018. 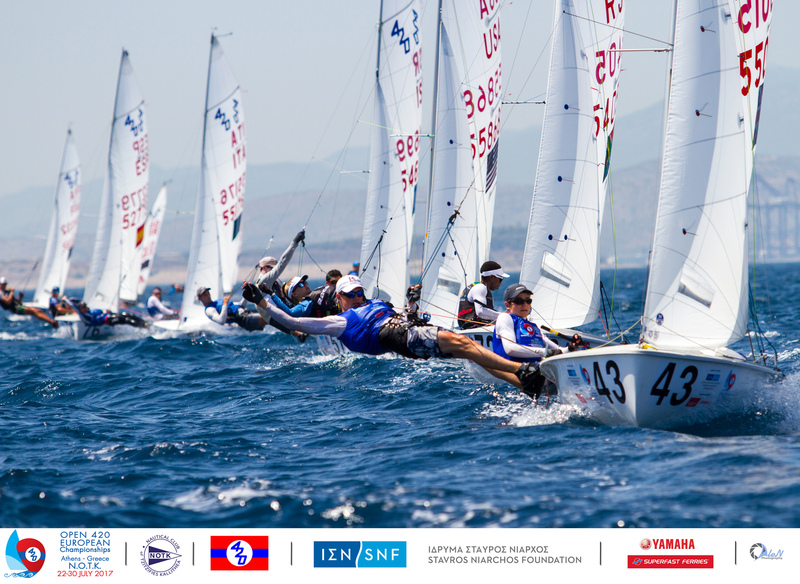 In the 420 Open, fleets will be seeded for the six race Qualification Series into yellow and blue fleets, before being split into gold and silver for the six race Final Series. 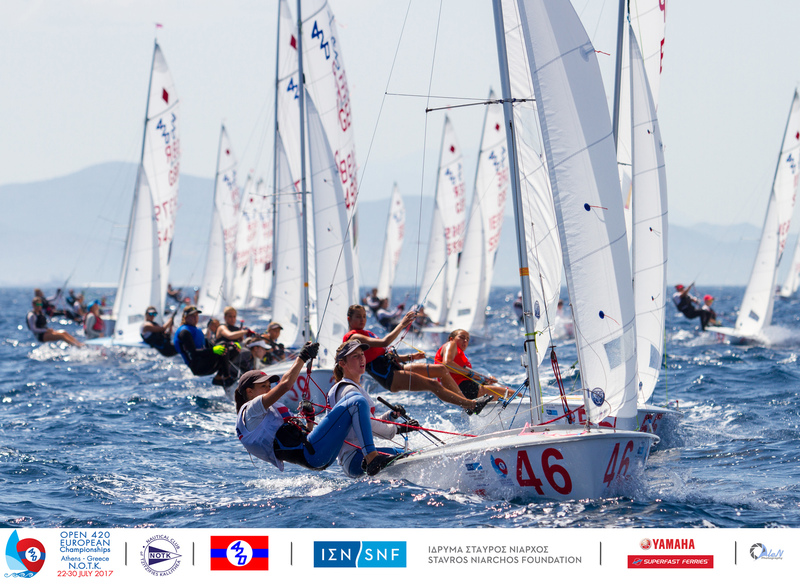 The Ladies and U17 fleets will sail a single series of 12 races. Races will take place over two race courses. 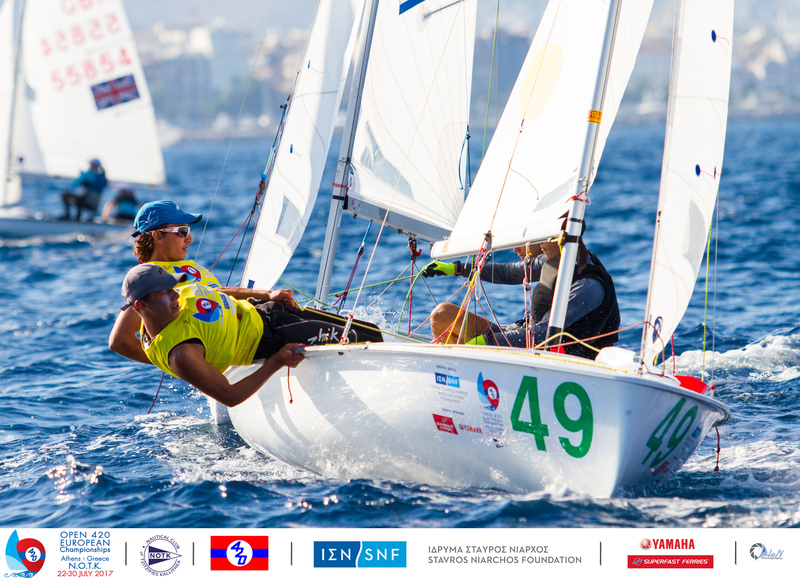 The 2017 420 Open European Championships is organized by the Nautical Club of Tzitzifies Kallithea in the iconic Olympic sailing city of Athens, Greece, in co-operation with the International 420 Class Association, Hellenic Sailing Federation and Greek 420 Class Association. 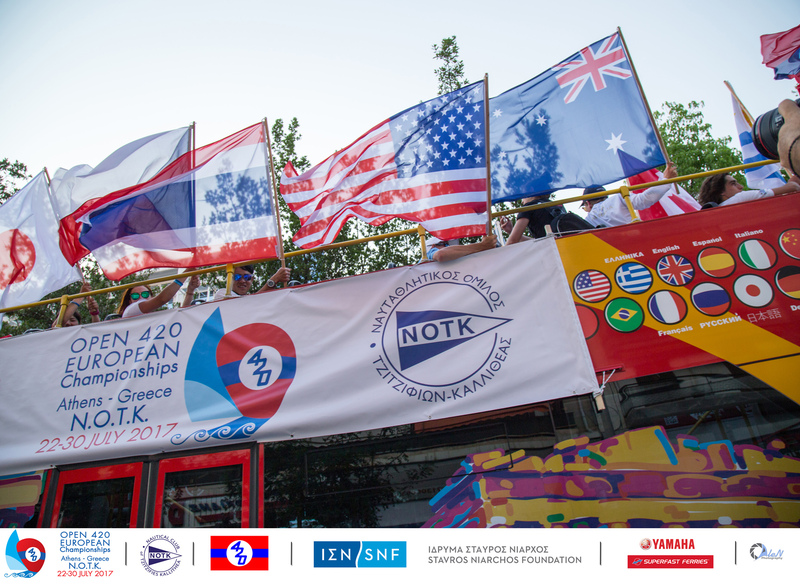 All six continents are represented amongst the 22 nations competing at the 2017 420 Open European Championships: Australia, Canada, Croatia, Czech Republic, France, Great Britain, Germany, Greece, Indonesia, India, Israel, Italy, Japan, Malaysia, Portugal, South Africa, Spain, Switzerland, Thailand, Turkey, Uruguay, USA. 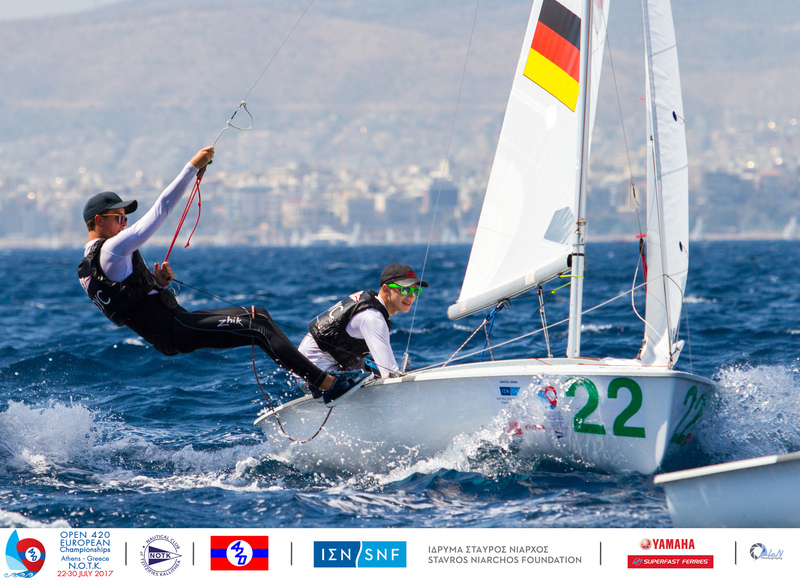 Championship APP - download the official APP for the 2017 420 European Championships and keep up to date with all the racing action from your favourite sailors wherever you are.